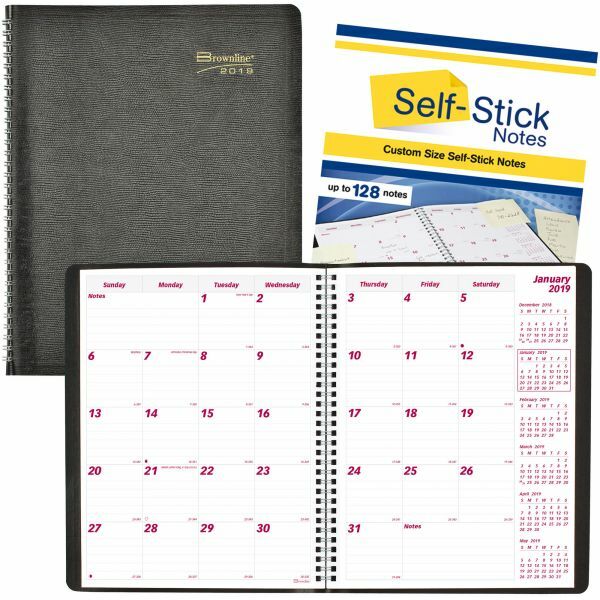 Features a vinyl holder that holds a notepad and functions as a page marker. A two-part self-stick notepad helps with follow-up on notes written. 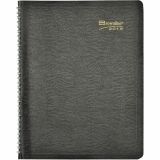 Includes telephone/address section and extra notes pages. 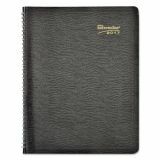 Brownline PlannerPlus 14-Month Monthly Planner - The 14-month planner offers self-sticking notes for easy follow-up, two-page-per-month format, twin-wire binding and a soft, lizard-like cover. Included two-part carbonless, self-sticking note pad comes in a vinyl holder for protection. Use included self-adhesive, laminated monthly tabs to find your place. 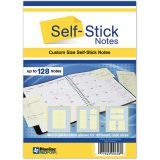 Self-Stick Notes form a repositionable note system where each page contains microperforations to customize the note size. Tear-off perforated corners to mark your place. Dated planning pages range 14 months from December to January. Two-page-per-month spreads feature ruled daily blocks, count of days/days remaining, Sunday-through-Saturday scheduling, holidays, and past and future months reference. 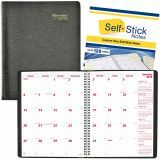 Planner also includes monthly self-adhesive laminated tabs, a telephone/address section and storage pocket. Paper is made with a high percentage of recycled material.